Visit the extraordinary Carrara marble quarries and taste its mouthwatering typical product: lard of Colonnata. Guided tour to the Carrara marble quarries to discover the history of its excavation and use in art and architecture, becoming a world renowned excellency for centuries. 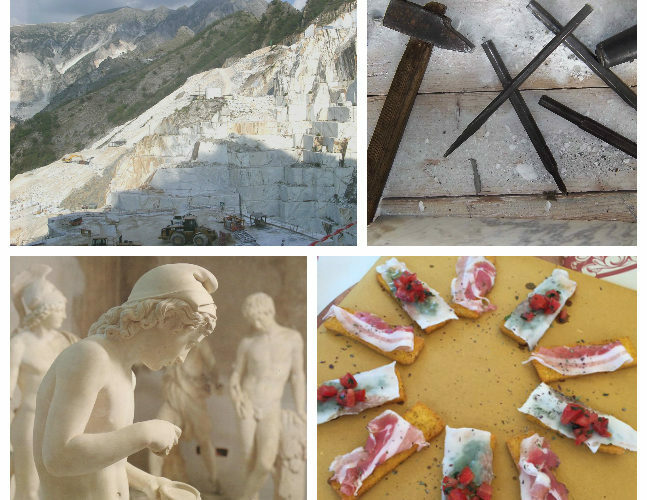 Visit the Miseglia and Fantiscritti marble quarries where some ancient Roman quarries are. Discover the history of marble and how its mining techniques, refine work and transportation have developped over the centuries at the Cava Museo Danesi, a private collection of pictures, tools and machineries. Next stop Colonnata, quaint little village popular for its delicacy, Lard of Colonnata, certified PGI product. Visit to a typical larderia to learn how lard is produced, seasoned and aged in big marble vats followed by lard tasting! In the afternoon possibility to continue the visit to the historic centre of Carrara, walking across its Fine Arts Academy, the beautiful Piazza Alberica, built in the Renaissance period by Prince Alberico I Cybo Malaspina, the gorgeous marble Cathedral and, just behind, the house that hosted Michelangelo during his trips to Carrara in search of the best marble to create his masterpieces. For individuals and small groups also possible to add a visit to an sculpture atelier to see how this precious material is turned into pieces of art. This tour can be booked and tailormade for individuals or small groups. Contact us for more info.